Since storage is one of the central themes when people are talking about the transition to renewable power, you might have been wondering how much storage do we need. And as many questions it has no easy answer, except: ”it depends.”. It is not easy to find some rough estimates on the web. And where I did, there was no methodology attached to understand their validity. Of course, there are scientific studies but they are hard to access and understand. So I set out to do some, as simple as possible, analysis myself. You can find the complete calculations here. Let‘s start straight with the big numbers. Of course, without a reference almost nobody knows if 25TWh is big or not. So let us put that into perspective. Germany currently has about 30 pumped hydro reservoirs. Together they add up to 0.0377 TWh of storage. Which gives us a first glimpse of how much 25TWh are, Germany would need 650 times as many pumped hydro installations as it currently has. 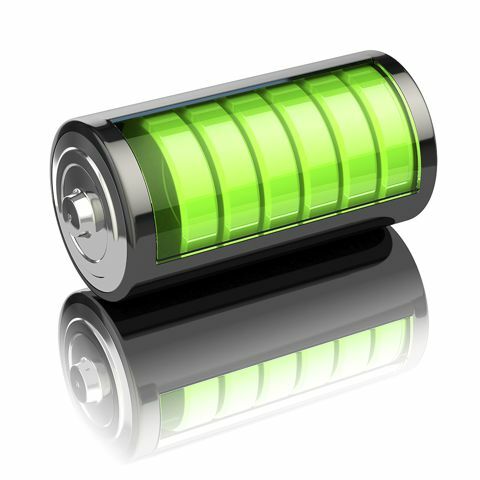 Everybody is talking about battery storage these days. So how would li-ion batteries do? Let‘s see: the Tesla Model S is available with 0.1 MWh of storage. This means we would need about 250 million Model S batteries. For comparison there are currently about 43 million cars in Germany. But battery production is picking up quickly in the world around. So how long would it take to produce as many as we need? With current battery production output, 880 years. With the estimated output for 2020 only about 140 years. Even if production doubles three more times this is still almost 20 years for Germany‘s storage alone. Why would we need so much? Therefore, these four weeks have a big influence on the overall storage need. Yet we can also see that production is not zero during these weeks. Therefore, if we were to scale up production capacities so that we would produce even more power than we actually need, we would most likely save on storage. 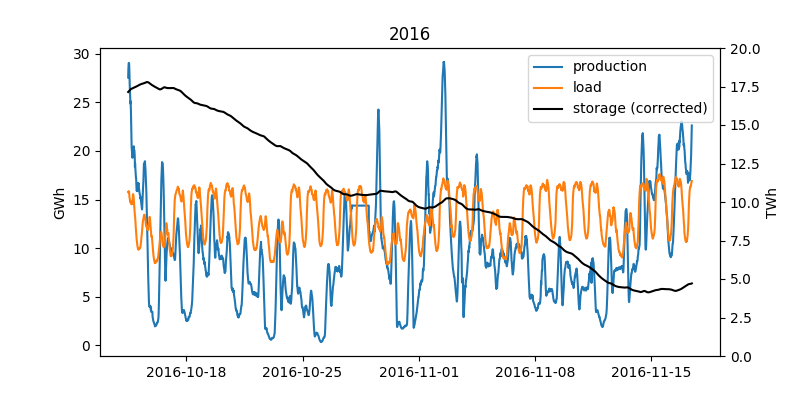 It is also important to point out that if we relax our assumption of a 100% renewable system, the storage need can be dramatically decreased by filling the gap during these 4 weeks with fossil fuels. This is indeed the case. The first thing we have to realize however is how far away Germany still is from producing enough electric power from renewables during one year and consequently even further from having over-production. To collect enough power with renewables to fulfill the yearly consumption Germany would need to upscale its current installation by a factor of four. So four times as many solar installations and four times as many wind turbines assuming no big changes in efficiency. Of course to achieve over-production even more. 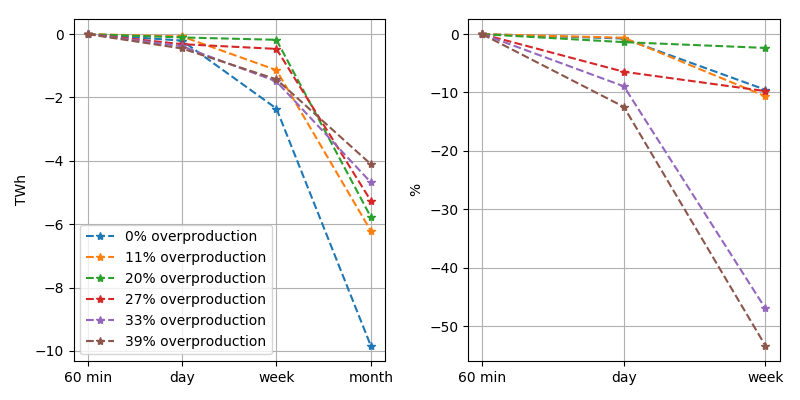 It is important not to confuse this with the situation that can already happen, where there is a short-term over-production from renewables, and for a few hours, they produce more than is needed. In the yearly sum they still only contribute about 25%. That is keeping in mind that we are only looking at the electricity needs here, therefore excluding heating and transport to a large extend. 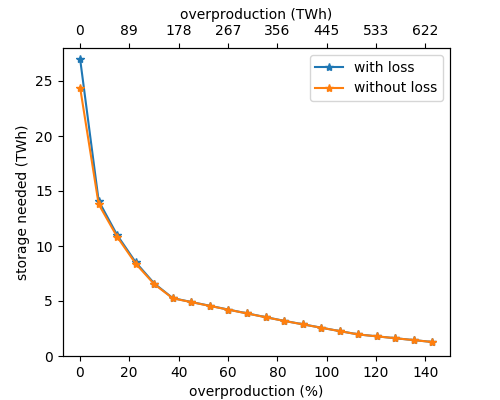 The above graphic shows the effects of overproduction on the storage need. As we can see the need for storage decreases, the more renewables are installed. Furthermore, we see the quite massive amounts of energy that would be overproduced during the course of the year. It needs to be pointed out that this analysis is done in the most simple way, so it does not take into consideration physical constraints about how renewables could be up scaled locally or if their power can be transported with the power grid to where it is needed. But again, the purpose of this exercise is just to get some rough idea about the size of the problem. So if Germany would manage to produce about 100TWh more than it really needs, the storage would reduce to only 6TWh. While this is still a massive storage (about 60,000,000 Tesla Model S batteries or 35 years of world battery output in 2020) it is only a quarter of the worst case estimate. The interesting thing about this scenario of course is the fact that if essentially produces ”free energy”. However before we dream of what to do with this free energy, there is one more thing that can be estimated: how much can smart appliances contribute to reduce the storage need. For example if we would use our dishwasher in those minutes when the sun is shining or heat our water when the wind is blowing. For this we assume that the smart appliances will follow the availability of renewable power perfectly, in other words they shift their power usage to not consume during times of low wind and solar availability and vice versa. 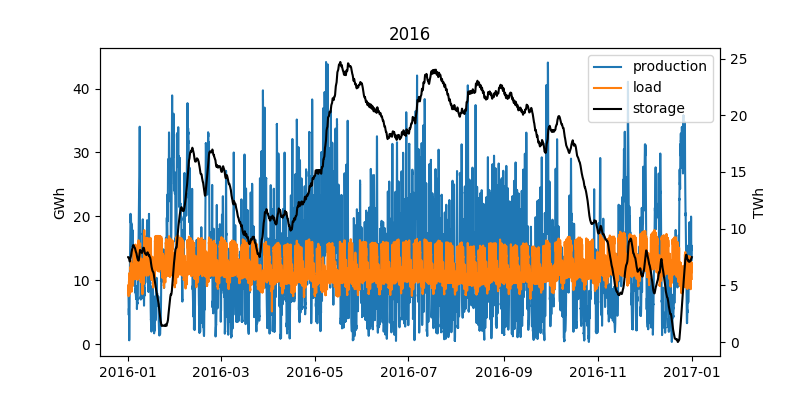 To simulate this, we can just aggregate our data on a daily basis, so instead of looking at an hourly mismatch between production and consumption we just look at the daily mismatch. So we implicitly assume almost perfect management of the flexible demand (like a smart dishwasher or storage heating). If we then compare the storage need for these daily aggregated data to the previous results, we see how much smart appliances and this type of demand response could save on storage in the best case. – the assumed demand response will not replace storage. It might be possible that flexible demand will play a bigger role during the transition period, where storage is very rare, but overall its role is limited. Even though li-ion batteries have come a long way, the energy transition will most likely need other means of storage to become reality.